MAX….. 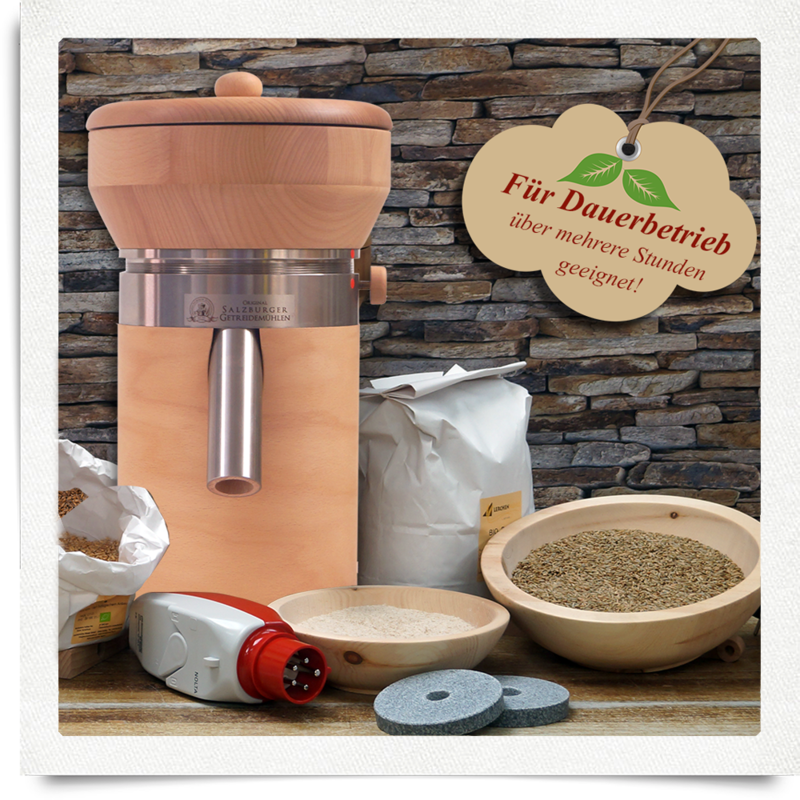 The popular and proven high- performance family grain mill! The affordable alternative to our MT5 available only directly from Salzburger Grain Mills! For more than 35 years we have been supplying these mills, originally under the name of „Agrisan 1″ and subsequently under “MAX”, whereby both types were fitted with the lower cost corundum/ceramic millstones. Now we have decided to also equip our model MAX with our popular and proven natural granite mill-stones. MAX stands for the ultimate development with regard to both technology and design – a development over decades, which can now use NATURAL STONE for the first time. Crushing: You want to start your day with a healthy breakfast muesli? For healthy breakfast muesli Max can crush larger quantities of grain kernels in the blink of an eye – saves buying a separate flocker (grain crusher)! The housing of the mill is made from hard beech wood. The milling chamber – To ensure that your grain and flour is processed as naturally as possible, we avoid using plastic and manufacture our milling chambers from untreated beech wood. The difference between MT 5 and MAX: Lies mainly in the design! Max appeals to lovers of modern, smooth lines – at the same time of high quality wood – MAX is the mill for all those who prefer a straight, angular look. The coarse/fine adjustment: One handed pressure on the side, wooden wheel causes the lifting or lowering of the lower mill-stone resulting in adjustment of the coarse/fine setting. The housing made of solid wood through and through from hard beech, is a pleasure for every nature lover. The treatment with organic beeswax brings out the character of the wood to the full. We pay special attention to the manufacture of the milling chamber, using only hard beech wood. In contrast to plastics, wood acts antistatically and anti-bacteriologically. The optimal matching of millstone diameter and rotation speed of the motor combined with the new heat and energy-optimised geometry of the milling mechanism guarantees gentle milling of the grain helping to save energy and money! Its integrated coil protection protects against costly damage due to overheating. The 12 year warranty demonstrates quality and durability! I’ve been very pleased with my MAX and I’m sure he will have a long life. He does everything I ask of him – from fine fluffy flour to chunky kibbled grains – what more could you ask for?